Financial advice and the number 72 – why 72 is the answer to the ultimate question of life, the universe and everything (not 42 as Douglas Adams would have you believe!). A family business is a journey – challenging, rewarding and often unpredictable. Should you decide to sell the business – often a daunting decision – careful planning and skilled execution are required to ensure a successful outcome. A recent survey of ultra-high net wealth individuals, highlighted the opinion that a lack of strategic planning for the family was the greatest destroyer of wealth. Perhaps the hardest decision for any family business owner is when, or if, to sell the family business. Selling a family business is like no other sale. It requires an approach which addresses both the family’s issues and the business’ issues as one, with the two often closely intertwined. It needs extensive preparation and great judgement, with timing and stakeholder management often critical. Most owners have strong family and emotional ties to the business – part of their family heritage and their collective identity. They may also wish to achieve specific outcomes for wider stakeholders, including highly valued staff and long-standing customers. The challenge is even greater when family members are actively involved in the company. Some family members may take a purely commercial view, whilst others believe the business should be handed down to their children and grandchildren and be part of their livelihood and collective identity. The business is often the most valuable family asset, so the sale should not be considered in isolation from the wider interests and future intentions of the family. The use of proceeds and future careers of family members are important considerations in the long-term success of the family. 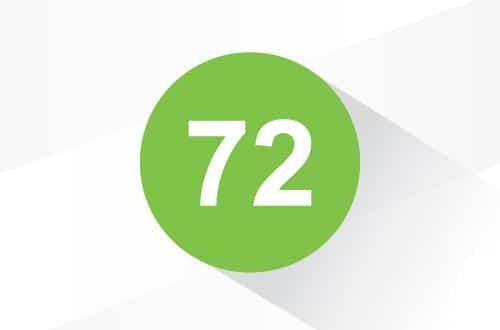 What is so great about the number 72? Let me explain what makes 72 The Answer. Using an example, if you invested $10,000 that earned you 10% per annum, how much would that investment be worth after 7 years? You may expect the answer to be $17,000, as 10% return on $10,000 for each of 7 years would be $7,000. However, the answer is actually $19,487.17 to be exact. This is because your investment earns interest on the interest each year, in jargon speak, compound interest. What this means is, at the end of the first year, you would have $10,000 plus $1,000 of return, and at the end of the second year, you would have 10% on this $11,000 (rather than just on the initial $10,000). Each year this happens, the greater the effect on your long-term returns. Of course, if you spend the 10% return each year, you will still have $10,000 at the end of 7 years. What about the number 72? How does that fit in? The number 72 allows you quickly and easily work out how much investments may be worth over time. It works like this – if you divide 72 by the interest rate, this will estimate how long it takes to double your investment. Using the example above, 72 divided by 10(%) equals 7.2. So your initial investment doubles from $10,000 to $20,000 after 7.2 years. This sounds pretty good, but it gets better as this doubling effect continues. After 14.4 years, you would have $40,000, then $80,000 after 21.5 years, $160,000 after 28.8 years, and $320,000 after 36 years. So in this example, your $10,000 investment would increase to $360,000 after 36 years. Pretty cool, isn’t it? Another great way to use this method is to work out the effect of inflation on your investments. Let’s say you have 24 years left before you retire, and you think you will need $1 million in today’s money to retire on. If you had one million dollars and put it under your mattress for “safekeeping”, that one million dollars would buy more today than it would in 24 years’ time because of the impact of inflation. If we estimate that inflation is 3% per annum, then 72 divided by 3(%) to gives us an answer of 24(years). This means that having $1 million today is the same as having $2 million in 24 years’ time, because of the impact of inflation. Considering inflation then, the $360,000 after 36 years in the first example is actually closer to $125,000 in today’s dollars. This is still pretty good, but does prove that the earlier you start saving, the better off you will be.